Rugae can be seen within stomach. Rugae is a term used in anatomy that refers to a series of ridges produced by folding of the wall of an organ. Most commonly the term is applied to the internal surface of the stomach (gastric rugae). 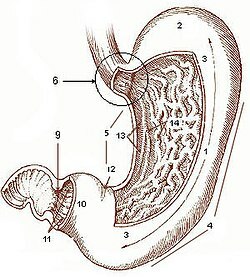 The purpose of the gastric rugae is to allow for expansion of the stomach after the consumption of foods and liquids. Rugae are only evident when an organ or tissue is deflated or relaxed. For example, rugae are evident within the stomach when it is deflated. However, when the stomach distends, the rugae unfold to allow for the increase in volume. 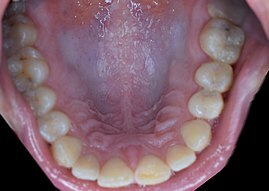 On the other hand, plicae remain folded regardless of distension as is evident within the plicae of the small intestine walls. ^ Moore, Keith L & Dalley, Arthur F (2006). Clinically Orientated Anatomy (5 ed.). Philadelphia: Lippincott Williams & Wilkins. p. 250. This page was last edited on 25 January 2019, at 10:47 (UTC).